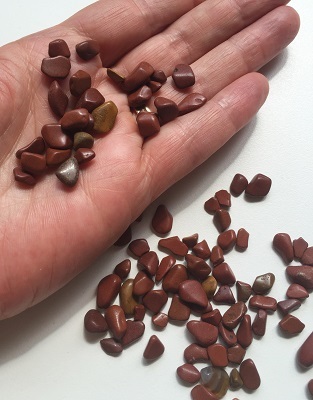 Terra Cotta colored smaller sized Red Jasper Tumbled Stones. These red jasper tumbled stones are the perfect size for medicine bags, smaller crystal grids, crystal intention gardens, or orgone generators.Jasper is known as the "supreme nurturer." Jasper aligns the chakras and may be used in chakra layouts. It has been said Red Jasper facilitates shamanic journeys and dream recall. Red Jasper provides protection and grounds energies and the body. 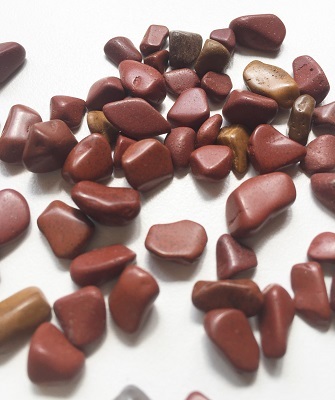 Red Jasper supports one during prolonged illness or hospitalization and re-energizes the body. Jasper acts as a reminder that one is not here, on this physical plane, just for oneself, but is also here to bring joy and substance to others, assisting others to release the bonds of constraint. 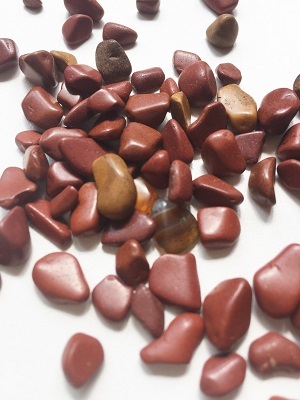 Red Jasper stimulates the base chakra and may be a helpful crystal tool for assistance in re-birthing. When placed under the pillow, Red Jasper helps dream recall. Red Jasper is a stone of health, strengthening and detoxifying the circulatory system, the blood and liver.